Ang Mo Kio was my childhood playground. Papa Ng used to own a men’s garment factory in Ang Mo Kio. When I was a kid, I spent most of my time at the factory, doing menial tasks like trimming the thread from the shirt’s sleeves, folding and packing them into boxes. My primary and secondary schools were in Ang Mo Kio too. Back then, the A&W near the library was my favourite place (hello coney dog). Since Papa Ng closed down his factory, there was little or no reason for me to go back to Ang Mo Kio. Recently, I needed some craft material for a friend’s birthday present which prompted me to Elsie Departmental Store in Ang Mo Kio. Elsie Departmental Store has been around for as long as I can remember. It has faithfully supplied me with material for my primary and secondary school projects. Stepping into Elsie, you will be welcomed by sights of pom pom tissue cover, framed cross stitch work and a table full of women(and sometimes men) crocheting and knitting. This place is old school and grouchy friendly (the owners’ faces look stern but they are very nice). My last trip there, the owner even offered me a banana and gave me an extra lucky draw ticket. After my errands at Elsie, I went over to the nearby coffeeshop (S11). 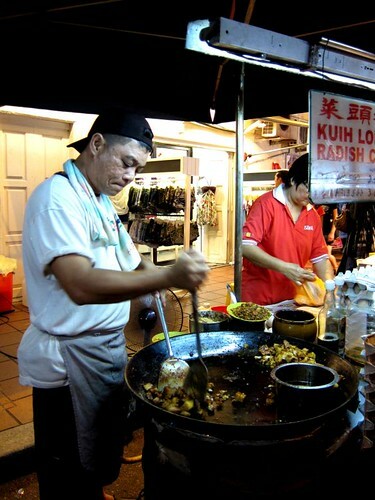 I wanted to eat my favourite yong tau foo but the stall seems to have moved. I was walking round and round, searching for possible lunch. 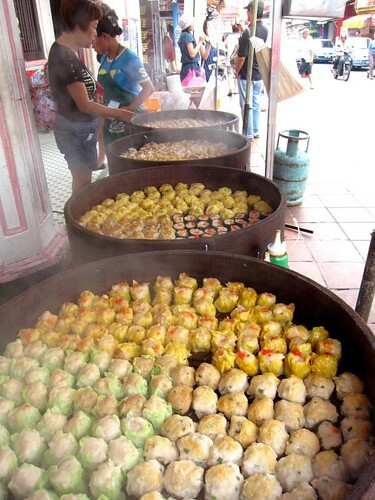 I settled on this inconspicuous stall – Penang Delights. 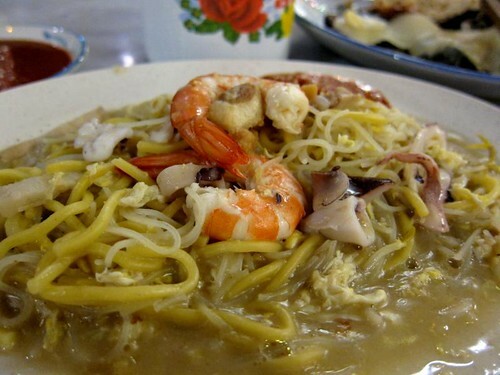 They served two things – prawn noodles and lor mee. 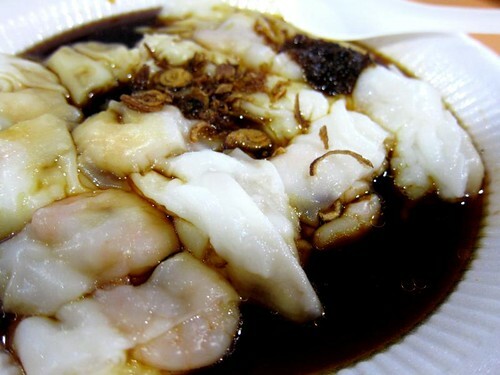 I opt for a bowl of prawn bee hoon noodles soup (S$3.50). The first impression of this bowl of soupy goodness was the richness of the broth. It was brownish orange and I could detect a “prawny” smell. I dived right in and have a sip of the soup. 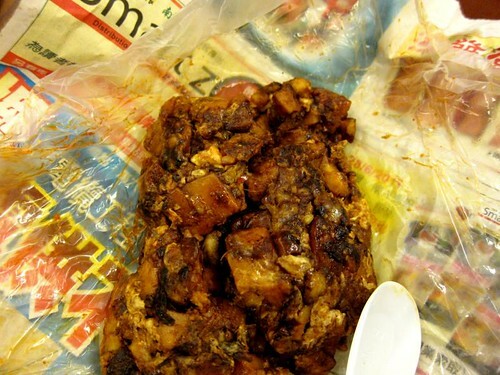 It was what I had predicted – rich, flavourful and comforting. Though I was lament that the stall owner gave me so little soup, if he had given me more, I doubt I would be able to finish it. The second thing that got my nod of approval was the prawns. The prawns were neither puny nor sliced into half. They were left whole. The stall owner was also very thoughtful. He had peeled the shell of the prawns, leaving the head and tail intact. 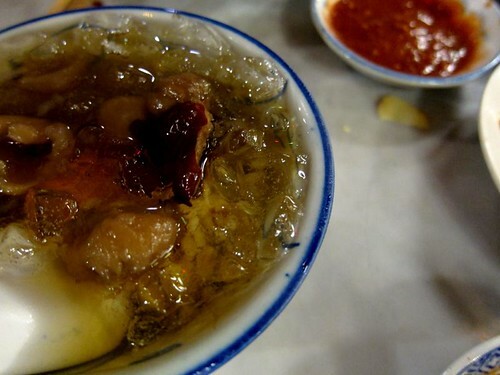 This also means I got to suckle on the prawn heads (hello cholesterol) and extract more “prawny” juice. And I do not have to get my hands dirty. 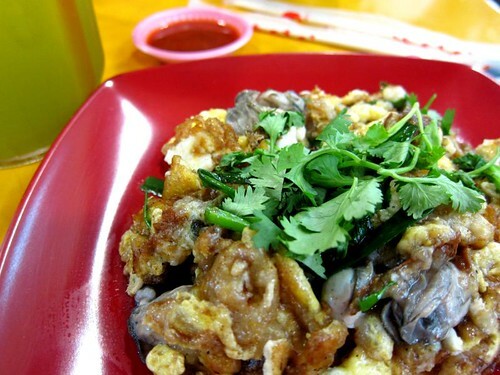 Thanks to Penang Delights, I can see myself returning to Ang Mo Kio (and of course, saying hi to all the lovely uncles and aunties at Elsie). I am blessed with friends who indulged in my silly quests for food. And Amy is one of them. Every time she made a trip to Singapore, I always ask if she could bring me a ramly burger which of course she said “No”. 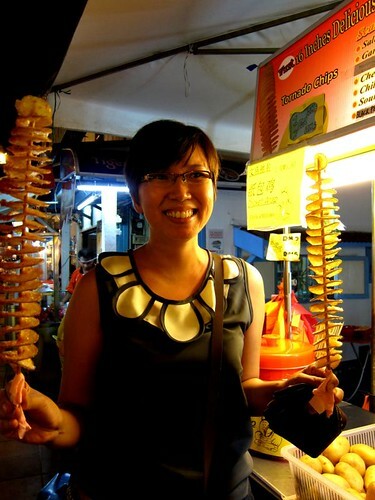 However for this trip to Kuala Lumpur, that girl makes sure I eat one before I leave. Guess what are in the bag? When Agnes and I were in Kuala Lumpur, it was pouring. 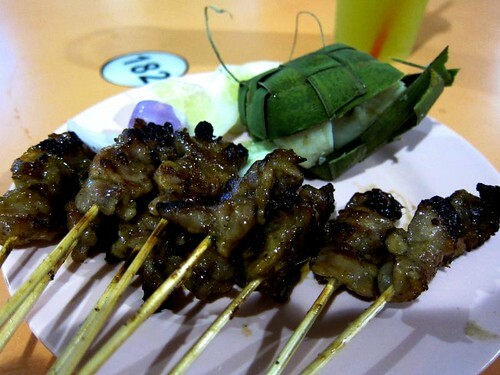 When there is rain, chances are the ramly burger stalls will be closed (the stalls are usually standalone and outdoor). On our last night, we had dinner with Agnes’ cousin Janet and it was still raining very heavily. At that point, I knew my chances of eating a ramly burger was nearly impossible. After dinner, the heavy downpour became drizzle. Janet dropped us at a nearby mall so that Amy and Terence (Amy’s partner) can pick us up. Amy called and told me she might be delayed as she was trying to see if the ramly burger stall near her house was open. When our ride arrived, the smell of ramly burger welcomed me. Ramly burger is like a cross between a sloppy joe and a hamburger. 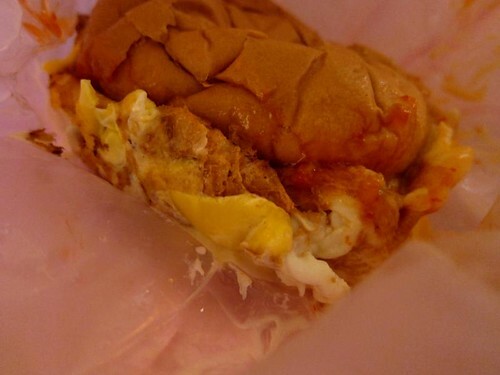 Though I am not a fan of egg, I often ordered the “special” ramly burger which is a chicken or beef patty wrapped in egg omelette and doused with mayo and some mystery sauce. I was stuffed from our dinner with Janet, still I will always have room for ramly burger. Once we reached our hotel room, I immediately took one and refused to talk to anyone untill I finished the burger. It was a freaking good burger. It was still warm and it did not get too soggy. 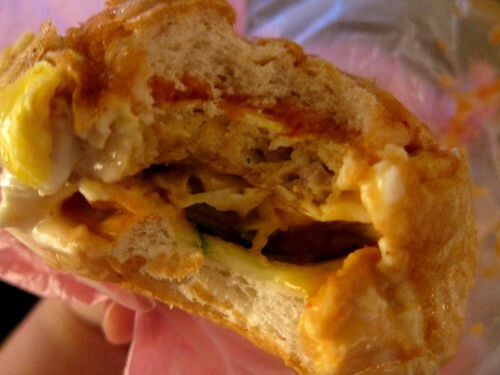 We do have ramly burger in Singapore but it is just not as good as the ones in Malaysia. I don’t know is it the patty or the cooking method. The ramly burgers in Malaysia are simply awesome. I think Amy can tell how much I love ramly burger, she even offered me Terence’s share. Unless I want my stomach to explode on the spot, I had to say “No”. I am utterly grateful I have friends like Amy who make sure my food cravings are satisfied. I am one lucky round belly child. 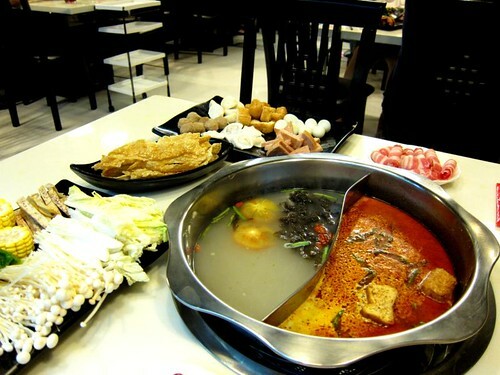 A couple of months back, I scored a Groupon deal – King’s Laksa Steamboat for S$10 per person (the usual price is S$18.90). King’s Laksa is very near my home and I heard pretty good things about it hence I quickly snatched the deal. As stated in the Groupon deal, a reservation must be made – which turned out to be quite painful. I actually had to make the booking two weeks in advance – the restaurant only portioned a certain number of seats for Groupon users. My friend (and neighbour) Serene and I could choose up to two types of broth – we went with Chicken and Laksa broth. Part of the Groupon deal was we cannot have any seafood which was fine with us as Serene was allergic to seafood. Still there was a good selection of food we could choose. 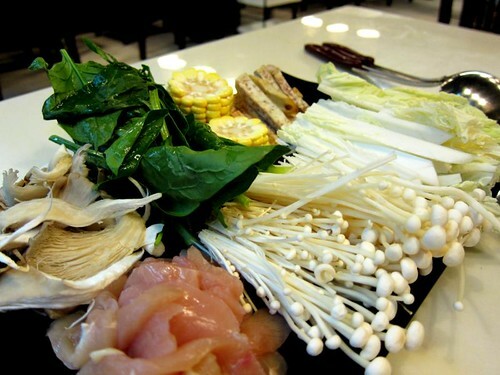 We went for a variety of mushrooms (enoki, oyster), vegetables (tang-orh, spinach), and an assortment of “steamboat” items (quail eggs, yam(! 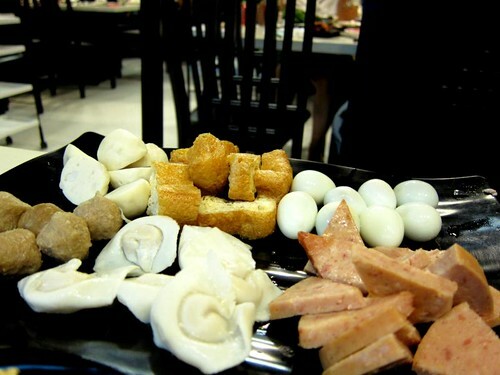 ), fish dumpling, tofu, luncheon meat). We also got ourselves a serving of beef, chicken and pork belly. 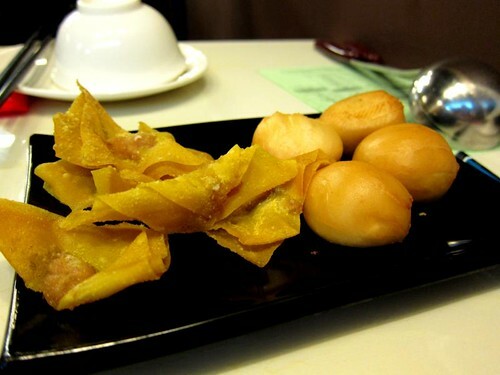 Beside the food that we need to cook, we ordered some complimentary cooked food – fried wanton and fried custard buns. 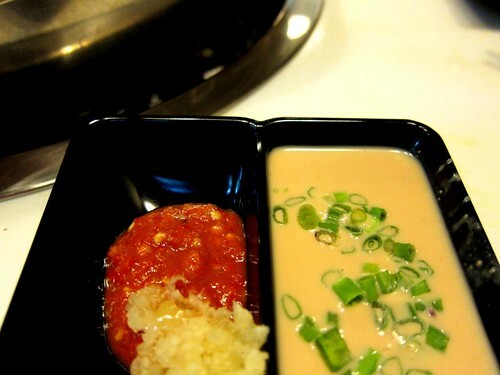 These two items were mediocre – unless you have serious cravings, don’t bother ordering them. As we waited for our food, I noticed people were walking to the back of the restaurant and came back with little plates of sauce. So I went to the back and saw they have tubs and tubs of different sauces. I chose my favourite – peanut, and chilli and garlic sauce. 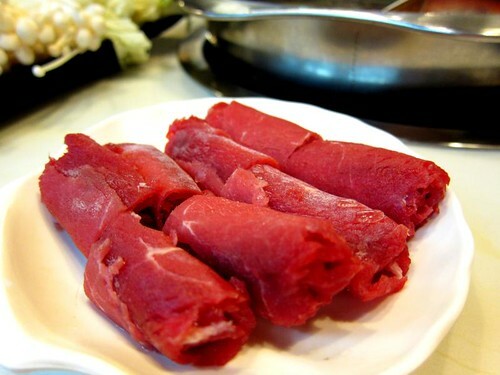 Once the food arrived (which was pretty fast), we quickly dived in and put all the raw items in the steamboat. I love that they put in pieces of tau pok in the laksa broth which absorbed all the goodness. 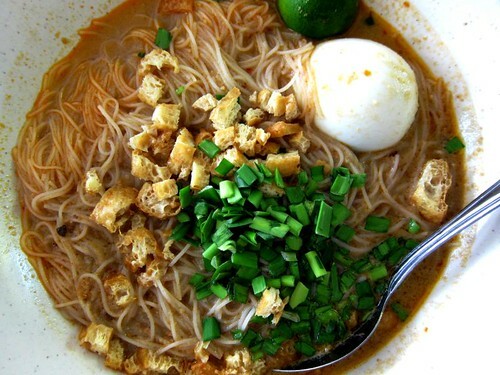 The laksa broth was rich and flavourful – it was not too spicy nor too lemak (coconut-ish). 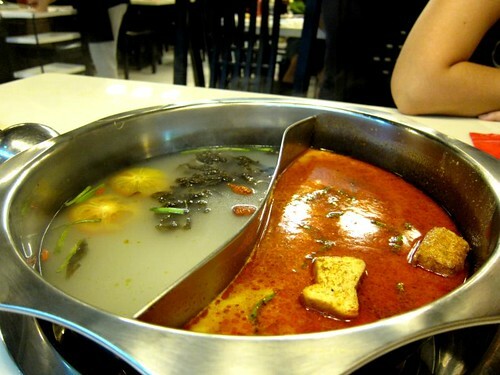 If the broth was too lemak, I think I would get sick of it pretty fast. For the chicken soup, I don’t really fancy it as the broth tasted like MSG (Monosodium Glutamate) and there was not much flavour. The sauces that I have selected – they were alright. I was a bit disappointed with the peanut sauce as I expected it to be a bit richer and thicker – the flavour was good but it was a bit watery. For S$10, this was a good Groupon deal. However we ordered two drinks (iced lemon tea and Coke) which totalled to almost S$7. I was told the regular price of S$18.90, it includes one drink and a small selection of seafood which perhaps might be a better deal. After dinner, we walked over to Nex (neighbour shopping mall) and did some grocery shopping. Serene was searching for dessert and couldn’t find anything she likes. She was also nagging for durian too. 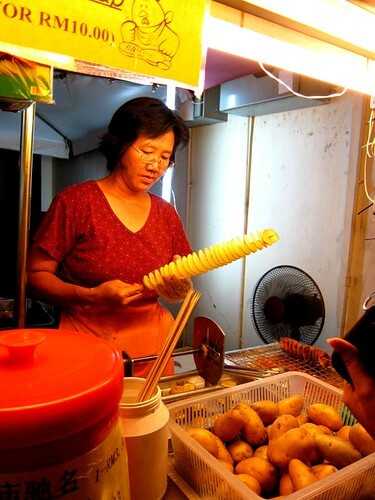 I told her that there was a durian stall nearby and was shocked that she didn’t know since she is a big fan of durian and the stall was pretty near our house. 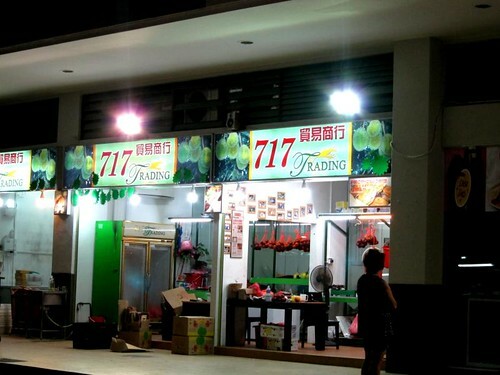 717 Trading have been around Kovan for as long as I can remember. I never had durians there, but their durian baked (durian coils and cream puffs) were pretty good. The great thing about this place – it opened till midnight. So if you have any late night cravings for durians, go to 717 Trading. 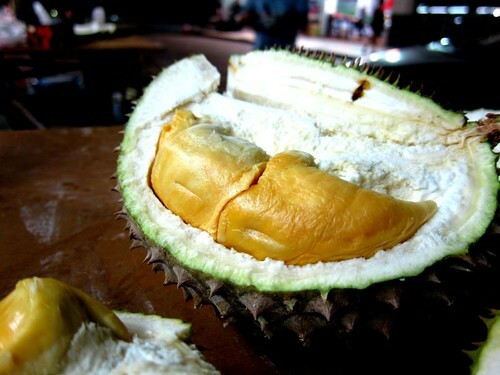 Since Serene was the “durian expert”, I made her select the durians – my criteria was the flesh must be bittersweet. She came back with two durians for around S$20. The flesh was indeed bittersweet, but I found them to be a bit tough. For the price we paid, they were a bit pricey. 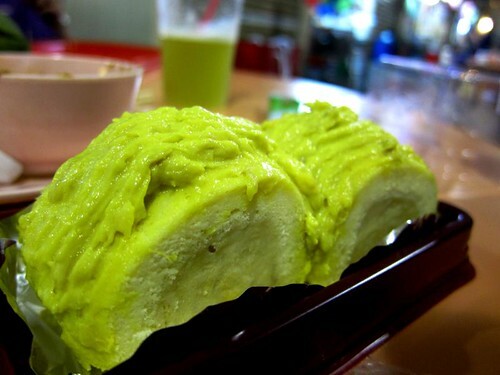 Once we were done with the durians, we went to the cake shop (which also open till late) and looked around. They didn’t have any puffs or crepes so I left the shop empty-handed. Got to love my neighbourhood for all the awesome eats and they opened till late! Since I moved to Serangoon/ Hougang 26 years ago, Serangoon Gardens is one of my frequent “playgrounds”. 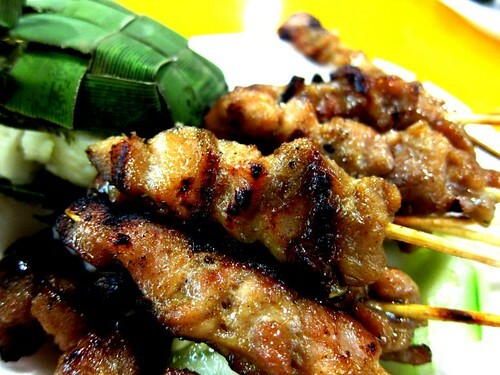 When I was a kid, I would follow Papa Ng (aka my dad) to Chomp Chomp Hawker Centre and get takeaways for family dinner. We would go overboard and order as much as possible. There was always leftover. 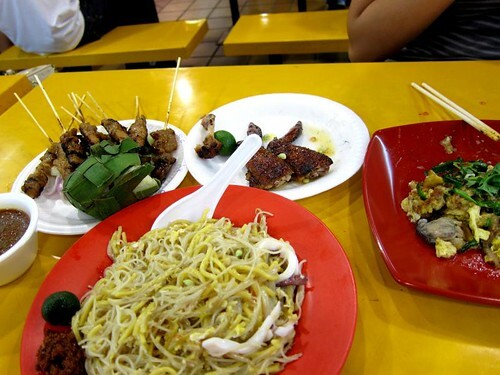 We ordered a few plates to share – hokkien mee, oyster omelette, satay(satay!!! 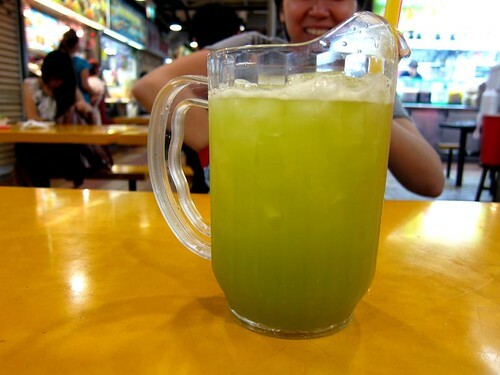 ), chicken wings and not forgetting the infamous giant sugarcane juice! Everything at our table was delicious. We wiped out our food pretty fast, and I brought Amy to another joint for dessert. 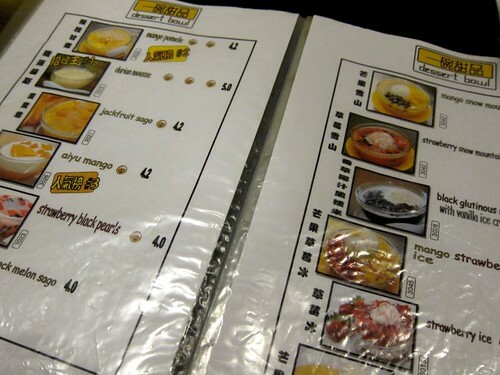 Dessert Bowl (一碗甜品)opened about 2-3 years back and they are located right above a (sleazy) pub. Despite the appearance, the desserts are outstanding. 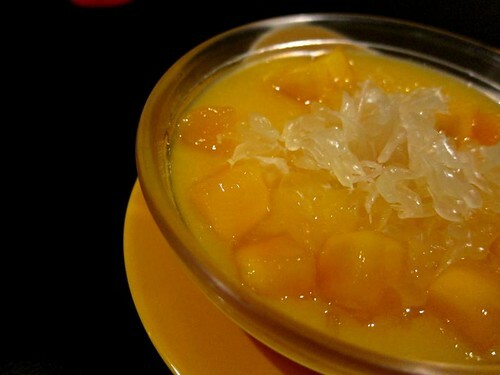 My all time favourite is their mango pomelo sago – sweet, smooth, and you get a good bite from the pomelo and sago. 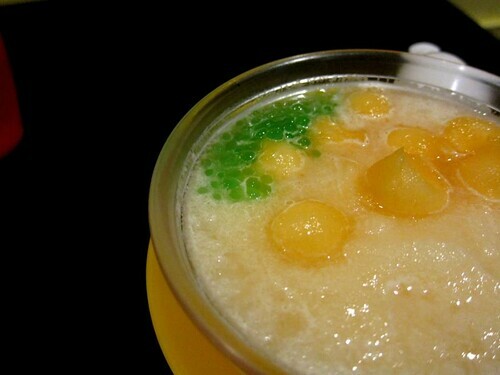 Amy ordered the honeydew sago which was a bit bland for me. 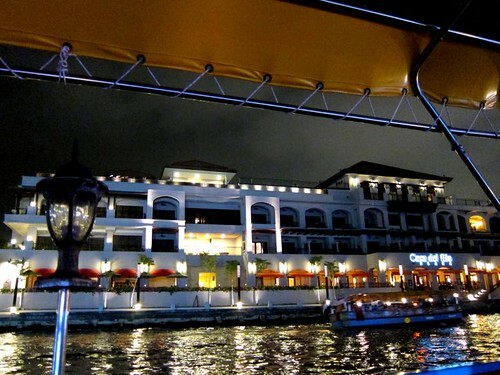 Though Serangoon Gardens and Chomp Chomp received some minor makeovers, and got a little bit fancy, I still heart the place. It is like a cute little town with all these quirks and personality, and definitely worth a visit. 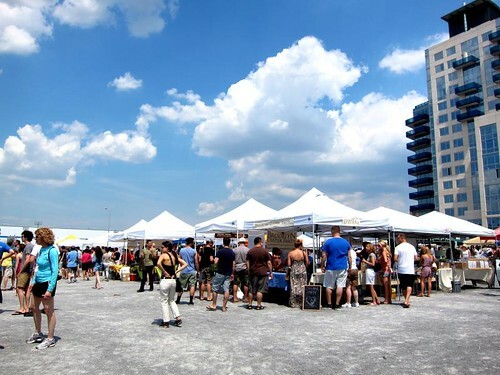 Situated at the old Fulton Fish Market, New Amsterdam Market is a weekly market that featured some of New York’s best food vendors. After our hot sunny walk along the Brooklyn Bridge (where Kat and I were almost melted), we were pleased that the market was sheltered (from the sun) and was pretty cooling. Perhaps it was the heat, the market was not crowded. It was quite nice to walk around and look at what each stall is selling. 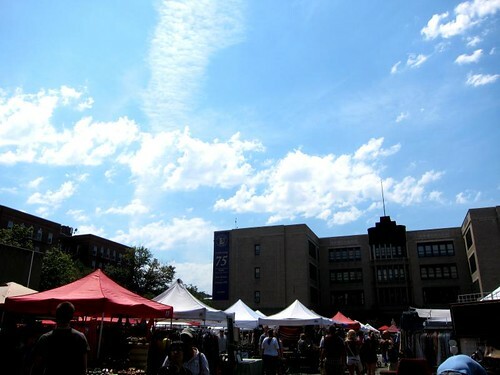 The focus of New Amsterdam Market was to support small businesses, introduce seasonal produces, feature local farmers, hence you see stall selling free range ducks, organic tea, artisanal cheese and handcrafted chocolate and candies and so many more. The first store I hit was Liddabit Sweets. 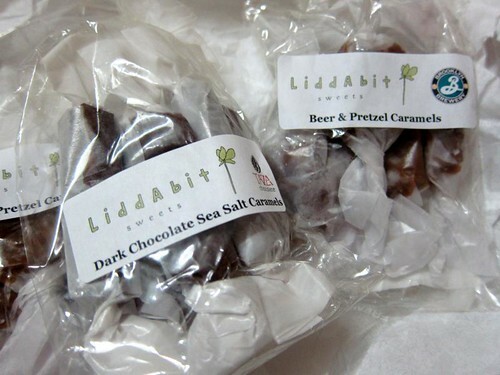 Started by Jen King and Liz Gutman, Liddabit Sweets specialised in making candies, lollies, chocolates – all things sweet. I was hoping to get some slurtles which were beer caramels topped with either pretzel or potato chips (I know, crazy right?) and finished off with a dark chocolate shell. 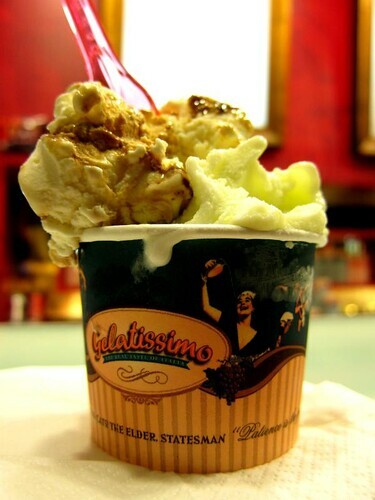 But due to the hot weather, no chocolate was on sales (sadness). However I managed to bag three bags of caramels – dark chocolate and sea salt (which was divine) and beer and pretzel (sweet and savoury). From afar, I spotted Sullivan Street Bakery. 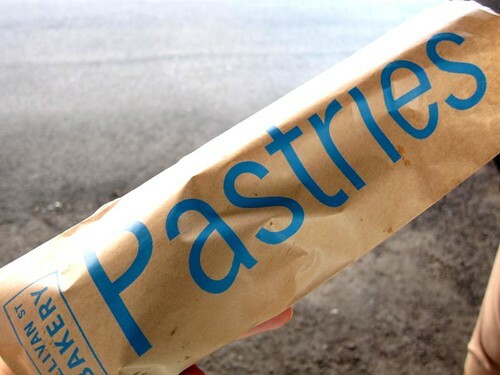 I’ve been wanting to make a trip to the bakery and I was so happy to see they have a stall (In case, you don’t know, I have a tiny obsession with Jim Lahey’s no knead bread and pizza dough). Though I was not in an eating mood, I could not resist getting one of the strecci with tomatoes. 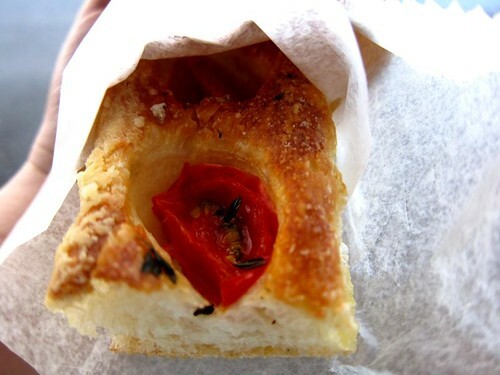 The bread was chewy and savoury, and with that bit of tomatoes and salt, it was perfection. 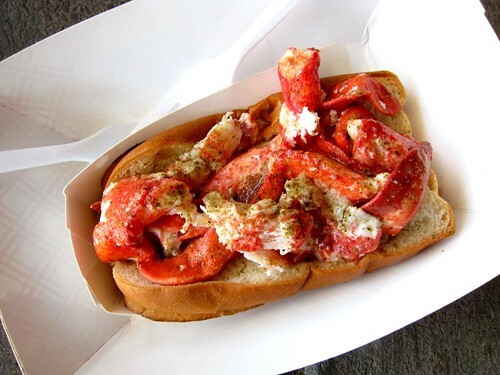 The last bite we had at New Amsterdam Market was at Luke’s Lobster. It was so good that it prompted Kat and I to go back a few days later to have the lobster roll again. And yes, I will talk about it later. 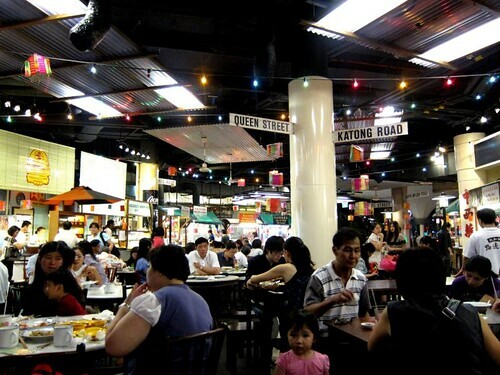 If we have New Amsterdam Market in Singapore, you will see my face at the market every Sunday, sniffing around and eating well. I don’t really eat breakfast. Between sleep and food, I rather choose sleep. My morning is always a rush. If I can gulp down a cup of coffee, I am in luck. When I got back from the States, I was suffering from pretty bad jet lag. I was waking up at 4am. So when you can’t sleep, what can you do? Eat! And I have some personal breakfast favourites. 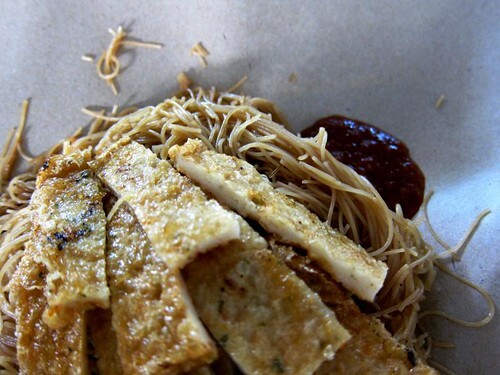 Fried beehoon. 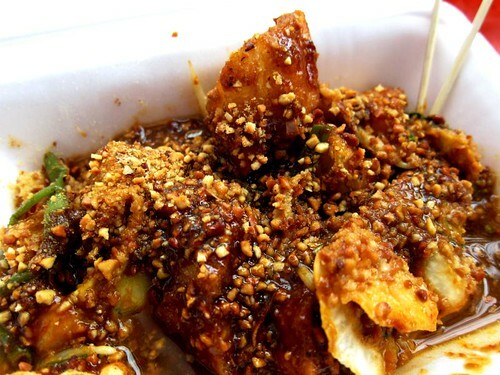 I remembered when I was a kid, I have this obsession with fried beehoon – I would have it every day for a year! 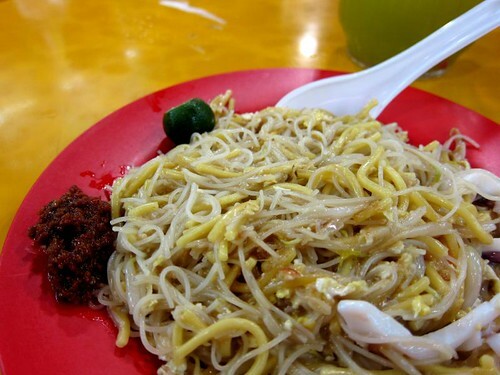 It was just plain old fried beehoon with a few pathetic bean sprouts and I was happy. Of course when you get older, you get a little fancy. 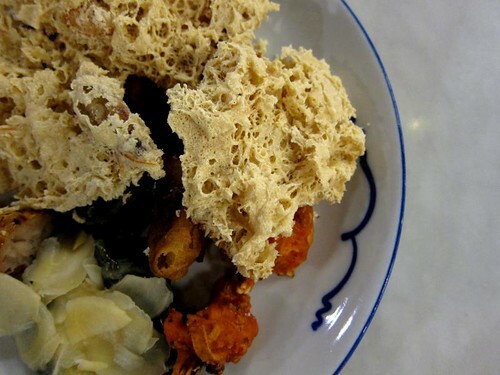 You can have otah, fish cake, chicken wing, egg – everything just goes with fried beehoon. I am also a sucker for roti prata. 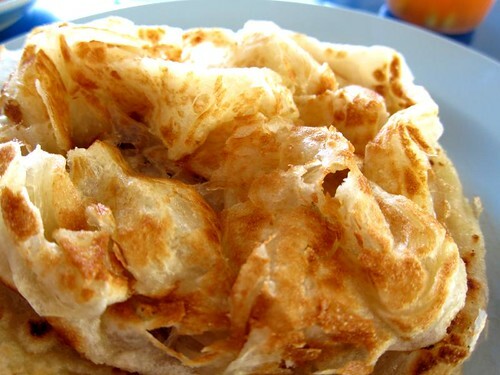 Its almost like fried dough – you get a nice, crispy skin, and inside the roti prata is warm, fluffy and chewy. Curry. Come on, who can say no to curry? And curry can be eaten morning, noon and night. 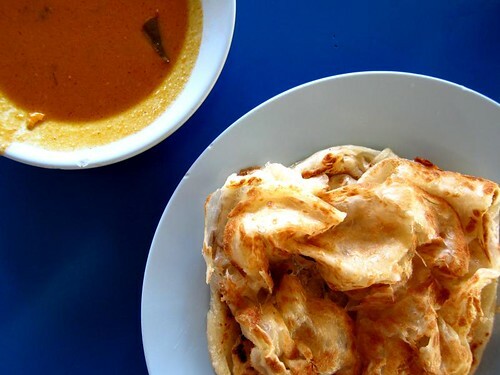 When you put roti prata and curry together, they are unstoppable! I will always snigger at those who only have one piece of roti prata. How can you stop at one? It’s not possible. 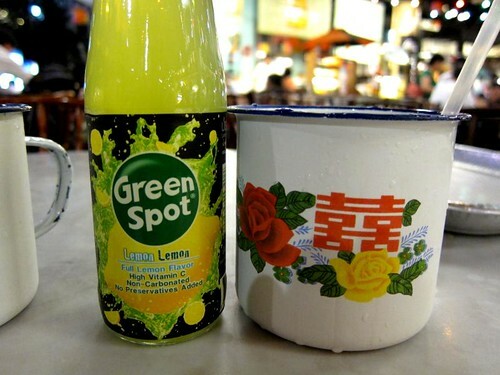 And I have two very essential beverages to go with roti prata. 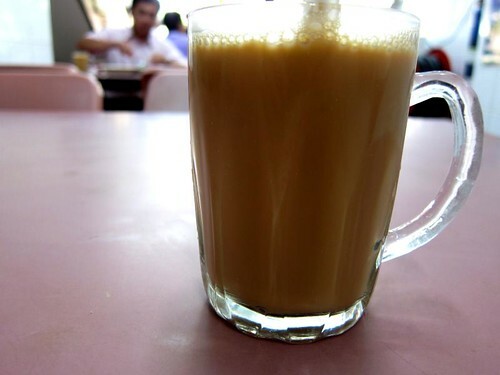 If I am having roti prata as breakfast, my choice of drink will be teh halia (ginger milk tea) – its warm, soothing and comforting. 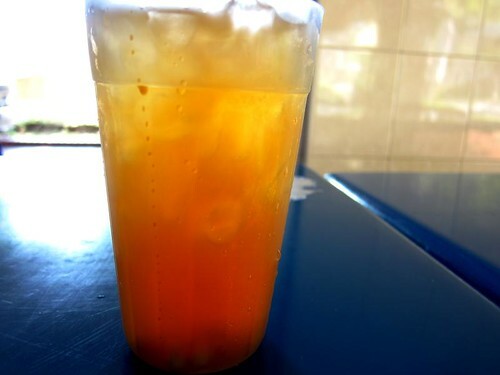 If the meal takes place in the afternoon, the drink has to be homemade (not those canned stuff) iced lemon tea – refreshing and thirst quenching. 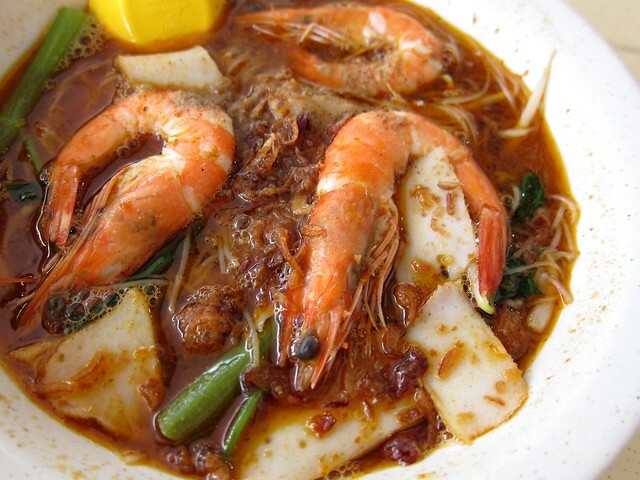 I will never be able to resist mee siam. Each sip of the assam broth, you get fireworks in your mouth – sweet, savoury, spicy and sour – there are so many layers of flavours in this simple dish. 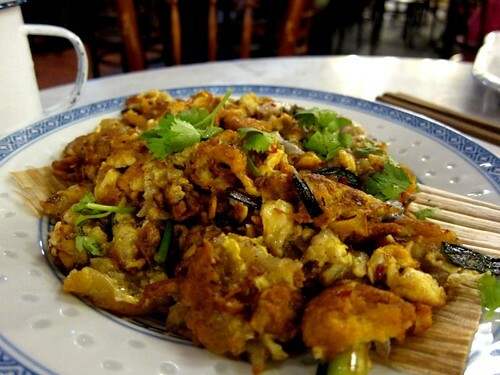 It is not a fancy dish – beehoon, beancurd and an egg. That’s all. 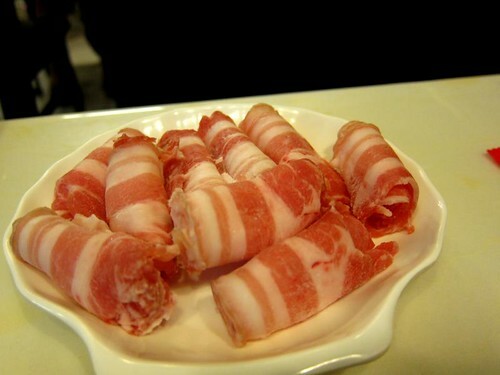 Yet it is delicious and satisfying. The great thing about staying in an Asia country is you have so many breakfast choices and every day you can try something new. And best of all, a lot of these breakfast items are available morning, noon and night. Which is great news for me as I will always choose sleep over food. 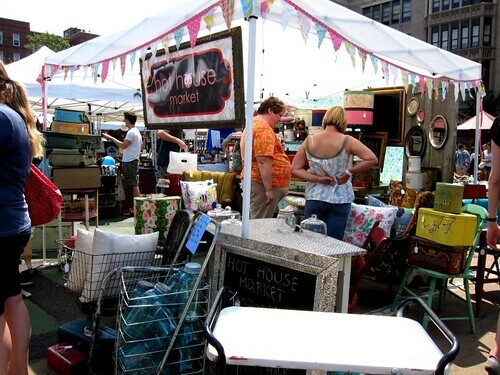 The Brooklyn Flea is a conglomerate of flea markets around Brooklyn which are held over the weekends. 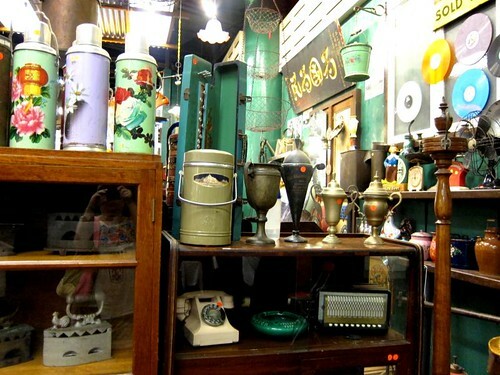 If you seek vintage goodness and yummy food, you cannot miss these wonderful weekend flea markets. 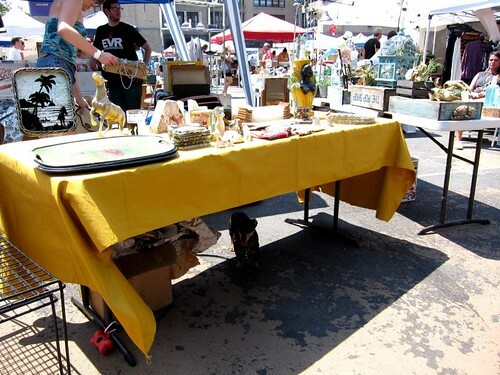 The first one I went for the day was the Fort Greene flea. Held at a school’s backyard, this flea featured 150 vendors selling vintage loots such as clothing, furniture, kitchenware, toys. And of course, there were a lot of food vendors parading their homemade salsa, sweets, pizza, soda and I can go on forever. 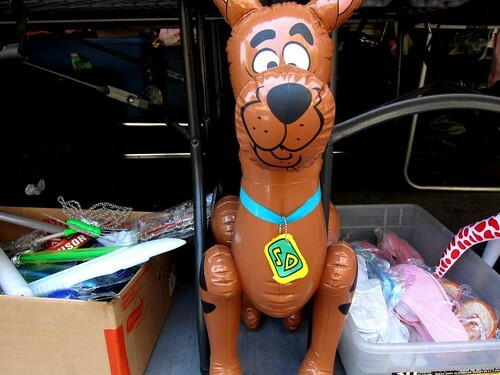 It was a really hot when I reached the flea market. After 10 minutes of walking, I needed to sit down and have a drink. I chanced upon this cool soda stall – Brooklyn Soda Works. Every soda is handcrafted, no preservatives. And they have unusual flavours too. I decided to go for the red currant and shiso. It was sweet and tart. 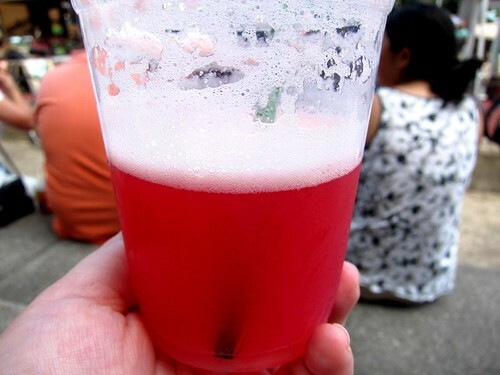 I am amazed the shiso which has an intense flavour did not dominate the drink – everything was well balanced. I love the Fort Greene flea. You get all sorts of knick knacks. One of the stalls that I went had all kinds of vintage ornaments and toys. I picked up a pair of Raggedy Ann and Andy table ornaments, a blue cat with spectacles toy and my prized possession – a Pillsbury Dough “girl” doll. All these loots for US$15. Incredible. The next stall I went is Hot House Market. Based in Indiana, the owner, Carrie Rosen, would drive to New York every two weeks and sell her wonderful treasures at the flea. Her vintage loots were amazing. I wanted to bag everything home, especially the suitcases. They were so cheap. In the end, I resisted and only got myself two canisters. After a quick tour of the entire flea, I decided it was time for lunch. Tacos! I got a chicken tacos and horchata from Choncho’s Tacos. The chicken taco was decent (this means average). The shredded chicken was a bit dry and the salsa was really spicy. 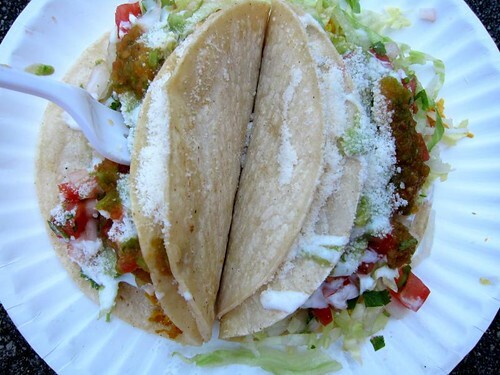 What I was missing was the flavour of corn in the tortilla – it’s the reason why I love tacos (I really miss the tacos at New Maxwell Street Market in Chicago. They were the best). 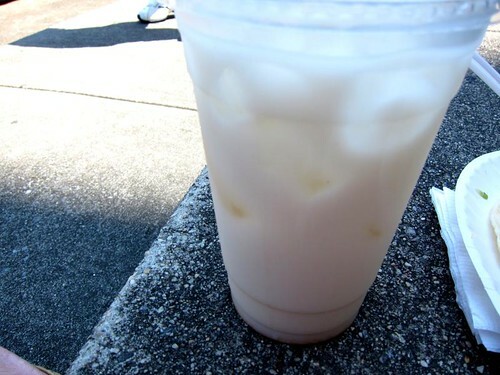 For those who are not familiar with horchata, it is a rice based Mexican drink and it was my first time trying it. The verdict? I don’t like it. I love rice milk and I thought I would love horchata. But I don’t. It was too sweet and the cinnamon flavour just put me off. And it left a residue on my tongue. Once lunch was done, I went back to the few stalls where I spotted items that I wanted to purchase. 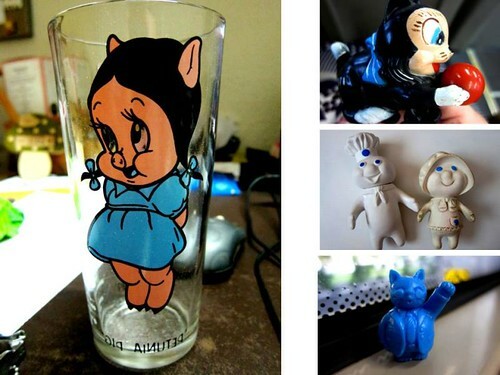 The final loots bought were a Pillsbury Dough “boy” doll, a vintage cat toy, 3 ancient postcards and a Petunia Pig glass. I left the flea a very happy girl. 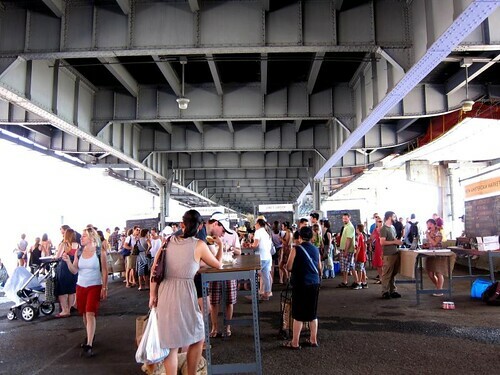 The next flea I went is Smorgasburg. 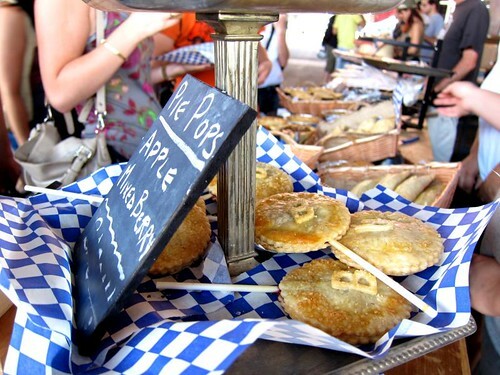 Smorgasburg is all about food – you can get delicious cheap eats, produce, kitchenware. 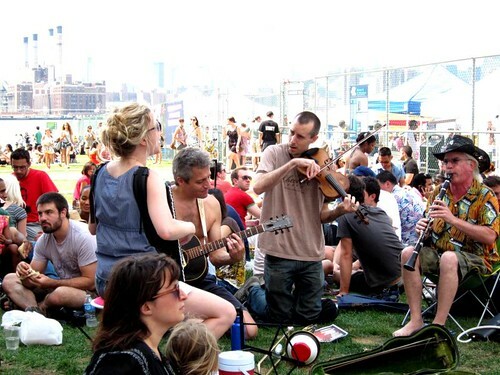 I wished I could have gone crazy at Smorgasburg. But I didn’t. It was hot, very very hot. It was near impossible for me to go and try anymore food. I tried my best to walk around but I gave up after half an hour. 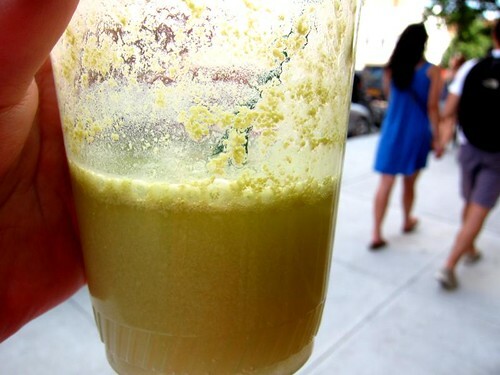 Before I left, I got myself another soda from Brooklyn Soda Works – cucumber, lime and salt. 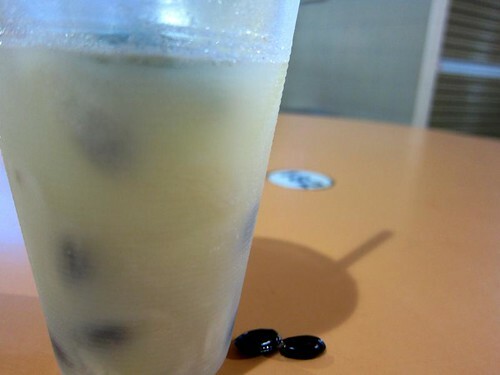 It was just what I need – refreshing and cooling. The salt was not strange at all, it actually complement the cucumber and lime. I really wished the weather was much better when I visited the flea markets. The heat deterred me from walking and eating. Still I left both flea markets with lots of treasures. Happy days.